Earlier this year Top Cow relaunched its Aphrodite series, giving the character a new spin by putting her in a post-apocalyptic future where mankind has mostly destroyed itself and is now divided into two factions, one that holds genetic engineering supreme and the other that holds machines supreme. The first arc was an absolute cracker and as a fan of the character from her appearances in Ron Marz’s Artifacts series, I thoroughly enjoyed the new take. With the newly-released #6, Matt Hawkins and artist Stjepan Sejic begin a new arc that picks up some time after the end of #5. The lead-up to this has been quite good and Matt doesn’t disappoint with the story. Aphrodite has been targeted by both sides of the ongoing conflict and a new faction has entered the mix, someone familiar and yet very different. The fun is in finding out how all the characters are continuing to develop and where they are all headed, as well as all the revelations about who and what Aphrodite really is. By the end of the last arc, Aphrodite IX had definitely been through the wringer. Manipulated and forced to become an assassin in a city populated with new-found friends, she eventually had to leave and now she’s a lone wolf across the devastated landscape that is the Earth of the future. And in such a state, she only has a drake as her companion, someone she bonded with while taking part in the big battle that went down in the previous issue that ended Matt’s first arc on the series. With the new one, he takes a few steps back and starts building up the world again, showing how things have already changed and giving us a teaser of what’s going to be happening in the future. The best part about this comic, once again, was the action. Pure, unadulterated action that makes use of all of Aphrodite IX’s martial kills. 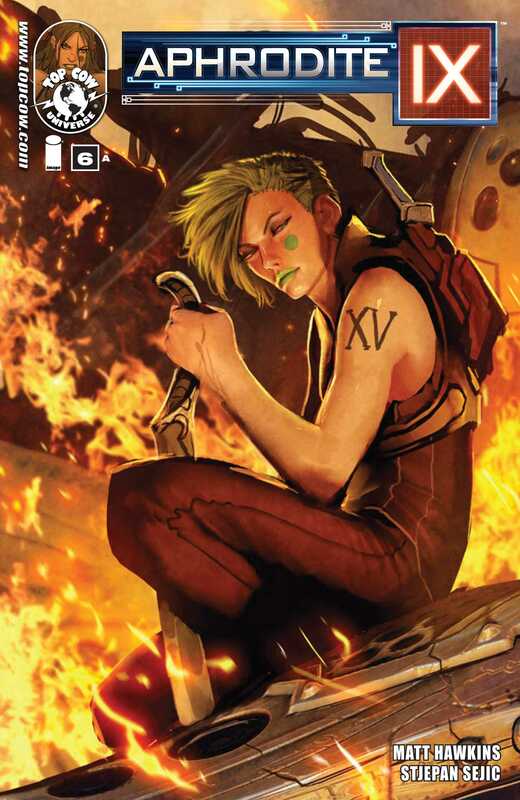 First against one kind of opponent, then another, it also serves as an introduction to Aphrodite XV, who we saw at the end of #5 and who is pictured on Stjepan’s cover for this issue (above). Given the numbering, there is obviously a big generational gap between the two Aphrodites and part of the fun is how they interact, and the older Aphrodite’s internal comments about her younger version. Matt maintains a unique voice for both of them and that was a definite plus. Over in Speros, we see how the newly-promoted Executor Jezebel begins to scheme anew with Burch, Aphrodite IX’s former handler who has allied himself with the Drones against the Gens, the people that Aphrodite befriended in the first issue. What helped this entire sequence stand-out was that we got to see a very civilian side of Speros, specifically the birthing process that is used by the Drones, with newborn children already being implanted with technology. We’ve only seen the political and military side of these people before so this offers a new contrast, and we get a taste of how society in Speros is like. And finally, back in Genesis City, we see how Marcus has grown. As much as Aphrodite suffered in the first arc, he suffered far more in the context of personal losses and the experience has left him changed. The religious fervor of his people has finally taken a hold of him and this issue marked his ascendance as a true ruler of his people. Very stirring stuff throughout, enough that I got goosebumps at some of Marcus’ dialogue. Matt has definitely excelled himself here. The issue ends with as startling a revelation as the previous one did and it makes for a great cliffhanger. With respect to the art, Stjepan seems to have opted for a slightly different style this time. Its got less of a movie-realistic feel this time and more of an animated one. As someone who enjoy the former, I was somewhat disappointed with the change, largely because it lacked a certain polish and if you can say one thing about his art its that he is usually quite meticulous. So the art was slightly disappointing on that front, but I have to say that he still has an incredible eye for detail, and this shows through in every panel, every page. There was a slight inconsistency with how Aphrodite IX was drawn, and that bothered me a bit since otherwise he’s been quite consistent. Overall, this was quite a good continuation of the series and Matt and Stjepan are off to a fairly good start. Bring on #7! More Aphrodite IX v2: #1, #2-3, #4, #5. Posted on November 29, 2013, in Comics Reviews, Review Central and tagged Aphrodite IX, Comics, Comics Review, Image, Matt Hawkins, Post-Apocalyptic, Review, Review Central, Stjepan Sejic, Top Cow. Bookmark the permalink. 4 Comments.